I had to look at the label again. In fact, (only) 12 years. 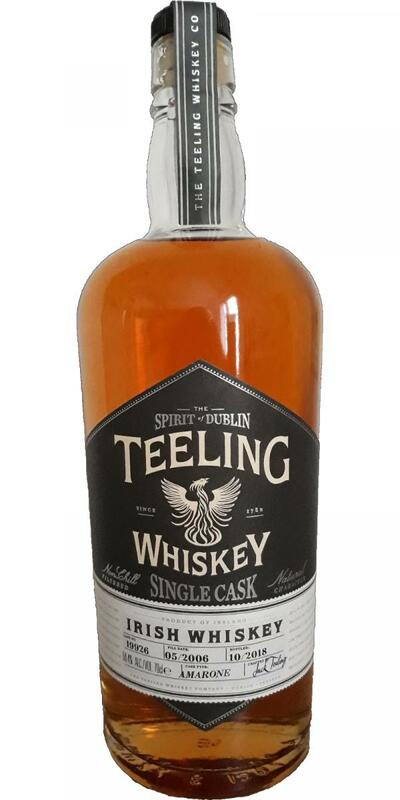 A very interesting and tasty single cask from Teeling. The Amaro barrel will have brought this very individual sweetness (without connotation). Can go wrong. Not here. Sweet child chewing gum, which beats one there. In the past Hubba Bubba would have been raspberry, nowadays there are certainly even more funky things. But it is not unpleasant at all, it looks like a light, sparkling summer cocktail in the nose. Candy, candied apple, cotton candy, popcorn. I just can not get away from the confectionery stalls. Cocoa beans, milk coffee, a bit of nutmeg. Raisins and figs come from afar, later some leather pulls through. The nose made no false promises, on the tongue it goes on just as sweet. Although it is again this bubble gum, combined with the other fair treats, however, the effect surprisingly not at all, but fits perfectly with the rest of the flavors, which, one has gotten used to the sweetness, but then at some point. Young wood, Werther's real, vanilla, honey, almonds - then comes to / next to the sweet pretty much. Medium long and dry. The sweetie has now disappeared. Wood and tobacco notes take the lead, spicy and slightly tart, he takes his leave.